Blockbusters (such as Humira, Enbrel and Herceptin) achieved huge success because of proven clinical efficacy, strong market demand, thourough IP protection and market penetration strategies. The strict R&D standards are the cornerstones of blockbuster. In the past 10 years, GenScript has been sticking to the "blockbuster" standards to manage, research and deliver every therapeutic programs. GenScript delivers humanized, human and bispecific antibody leads with good biological efficacy, safety & manufacturability in 12-15 months, as your one-stop solution from Targets to Therapeutic Antibody Candidates. Antibody sequencing, epitope binning, cross-reactivity test, etc. 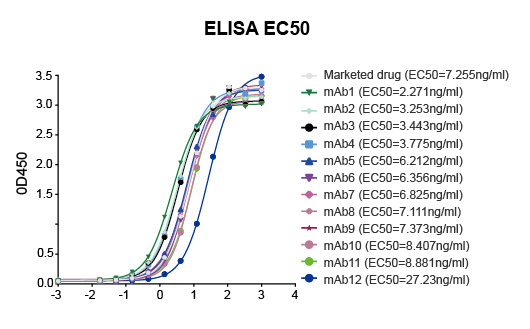 12 antibody leads recognizing 2 distinct epitopes were obtained. 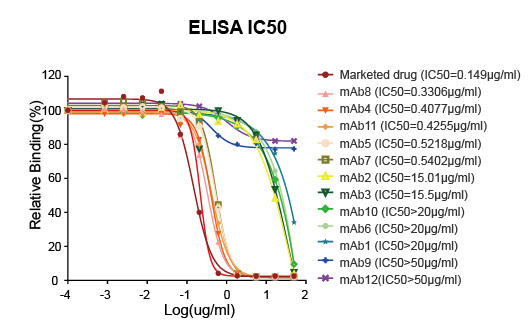 2 antibody leads with different epitopes were moved forward to lead optimization. 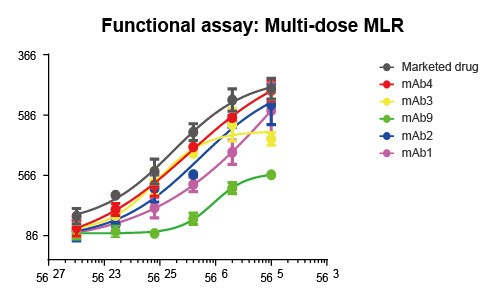 2 antibody leads were humanized and then tested by functional assay. Their developabilities were evaluated by both experimental & predicted approaches.